Back in December, we shared with you how we created an elegant French Country holiday design using a variety of elements, including a beautiful burlap tablecloth crafted in the Nandina workroom. Burlap may seem rather plain, which can cause this material to be underappreciated, but with an eye for design and a little creativity, this material can be used to create gorgeous looks for everything from tablescapes to window treatments, and almost anything in between you can imagine! Below are a few ideas that we really like. 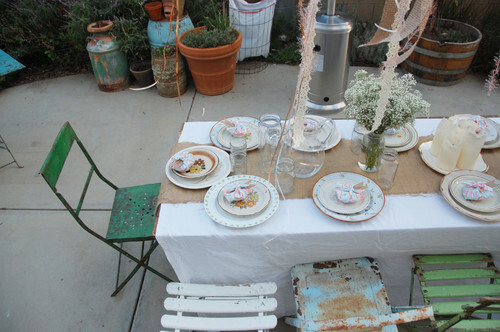 Here a simple piece of burlap has been used as a table runner for an outdoor dining event. 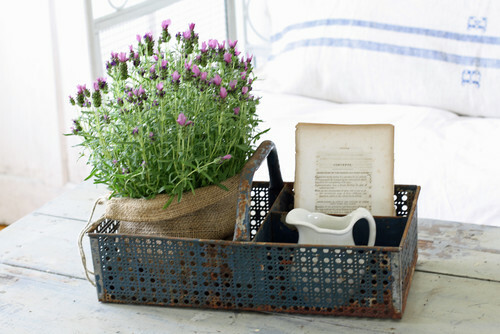 We love how the combination of burlap, simple flowers in a Mason jar, and ribbons create a Southern chic look. 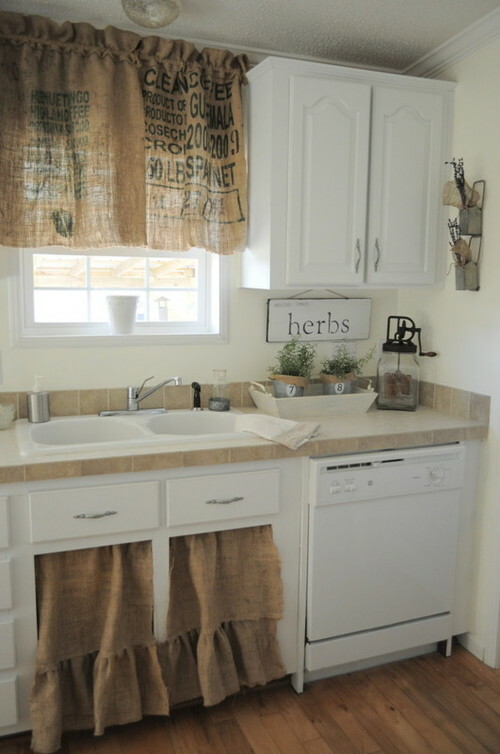 A rustic kitchen complete with burlap curtains lets in just enough natural light while still preserving privacy. We love the ruffled detail on the curtains used to hide the underneath of the sink. Looking for a way to cover up ugly plastic pots? Wrap them in burlap. It looks beautiful and helps insulate your plants. What’s not to love about a fabric that can pull double duty? This ruffled burlap ottoman reminds us of the tablecloth we created for the holidays. Here is another great burlap table runner, adorned with a luscious green fabric on top. As you can see, burlap is quite the versatile fabric, and we look forward to another opportunity to create something gorgeous with it. If you’re in need of additional ideas, click on over to Pinterest. Images 1-3 from Houzz. Image 4 from Craftionary.net via Pinterest. Image 5 from Livingwithlindsay.com via Pinterest. 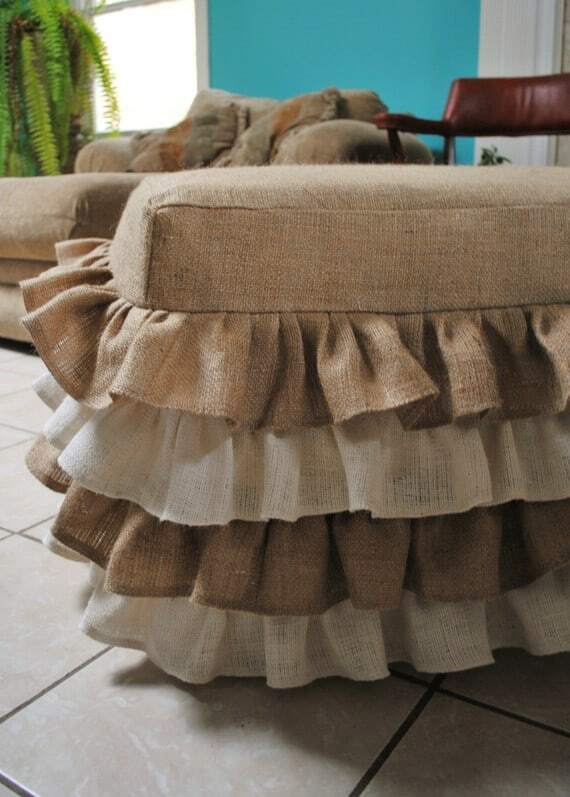 The ruffled burlap ottoman catches my attention, it has this classic look at the same time stylish.